I'm not sure where or when you're going to be able to see it, but if you EVER get the chance, then you really MUST. 'Benda Bilini' is one of the most inspiring documentaries I've ever seen. 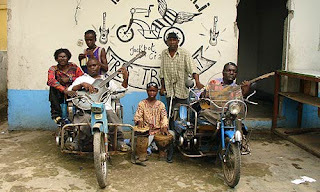 It's about a group of mostly disabled Congolese musicans who; in the midst of abject poverty, crime & corruption in the heart of the Congo; manage to keep going by being creative and following what they believe and know to be their destiny: that they will be known as the world's greatest disabled band. The music is INCREDIBLE, the camaraderie of the band is INCREDIBLE, the strength and resolve of the Congolese is INCREDIBLE. These are guys who've spent most of their lives sleeping outdoors on cardboard boxes. They would spend their days in a center for disabled people and when that place got burned down, they carried on as normal, because it's part of life in the Congo. These musicians literally had NOTHING, except each other and their instruments-- instruments that were often broken, or custom-made/invented by themselves. With passion, hope, and some help from French filmmaker Renaud Barret and a record company, they went on to record their inspired music, and then take it on tour to Paris, and then this year--- around the World. I cannot really explain what is great about this documentary and what it meant to me, I don't have the words; I can only recommend you see it. On the one hand, it makes you realize how difficult life in the Congo really is, it makes you realize just how privileged we are. But on the other hand, you realize, Staff Benda Bilini don't want our sympathy, they just want us to hear their music, to appreciate their remarkable talent, and we really should. Below is a YouTube video of one of Benda Bilini's songs-- unfortunately, there's not a great deal of them on the net, at least; not with subtitles. You can appreciate their talent without knowing the lyrics, but seeing them adds something because you get to see the depth of what they're singing about. Luckily, all the songs in the documentary 'Benda Bilini!' are subtitled. The film is being released in France in September, and hopefully in the rest of the world soon after. I write this today not expecting that you'll see the documentary in your multiplex any time soon, but just in case you do, or if you see a band called 'Staff Benda Bilini' touring near you- then you should check them out. These are a group of people who have had tough, tough lives; living in poverty, with no money, on the streets, for pretty much their whole lives. But rather than bitterness, anger and resentment; they come at us instead with beautiful music. Inspirational in the extreme. "My instrument is made from a tin can that held fish, and one single guitar string, and some wood. There's nothing else." wow. that sounds amazing. I hope I can see it somehow. have you ever seen "War Dance"? it seems similar. 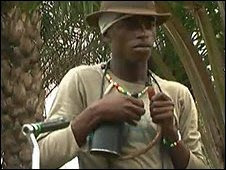 it's a documentary about kids in Uganda who are dealing with the war, yet they still dance and sing and get to compete. it's so good! Their Music is absolutely brilliant - a must see when theyr next tour. Their enjoyment is so evident in their playing and this infectious enthusiasm rubs off on the audience. Dying to see their film now.